Stroganoff is a classic Russian dish, traditionally made with pieces of beef and a rich creamy sauce. This seafood version uses salmon fillets paired with fragrant asparagus; the addition of smoked paprika balances out the richness of the creamy sauce perfectly. Cook the rice in boiling water for 25 minutes and once cooked, drain. Heat the oil in a frying pan and fry the salmon and mushrooms for 3-4 minutes. Stir in the asparagus, cream cheese, milk and paprika and cook for 1-2 minutes. Season to taste. 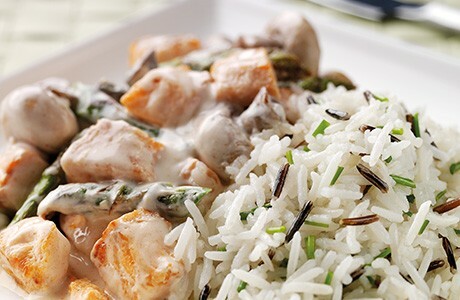 Mix the chives into the rice and serve with the salmon stroganoff.